An article by Wilson Thomas on thehindu.com - Rare pre-historic rock paintings identified near Viraliyur - reports on the discovery of rock art in the Indian state of Tamil Nadu. Rock art depicting two hunters at Mel Saamy Kugai in Coimbatore. Image: Hand out email. The cave houses more than 10 images in red ochre and one composition in white. 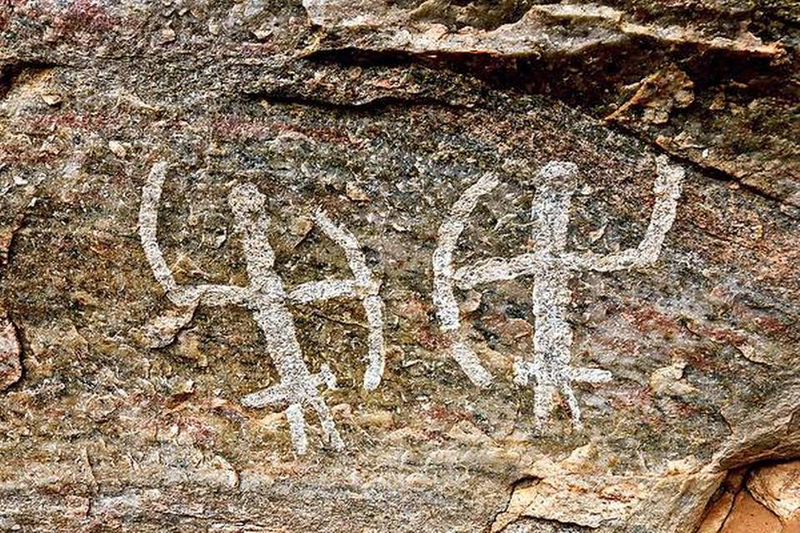 Two deer, and two hunters with bow, arrow and daggers in their waists are among the depictions recently identified in a cave, known as Mel Saamy Kugai, near Viraliyur, north-west of Coimbatore. The rock art is believed to belong to Neolithic period and the Iron Age. The work is being carried out by rock art researcher and art historian K.T. Gandhirajan, along with rock art enthusiasts Kumaravel Ramasamy and Sudhahar Nalliappan. The cave also has paintings of unidentified signs and symbols. The researchers explained that the early hunters would have had a deity - a hunting god - for the purpose of hunting, hence the rock art depicted in Mel Saamy Kugai. Close to the cave, there are two springs which could have been source of water for animals and humans. The red ochre paintings at the cave seem to be of the Neolithic period (3,000 - 4,000 BCE) on the basis of subject and style. The white painting of two hunters could be of the Iron Age (2,000 - 2,500 BCE).